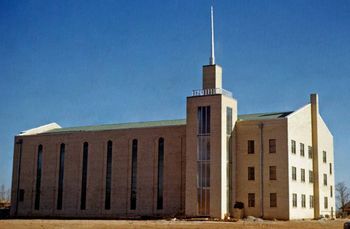 The Corn Mennonite Brethren Church, Corn, Oklahoma, with a baptized membership of 680 in 1954, is a member of the Southern District Conference of that body. It was organized 2 November 1893 by 16 Russian Mennonite families coming here from Goessel and Buhler, Kansas, early in the same year. At first services were held in homes; in 1894 a dugout church was built which gave way to a frame building in 1898, to which two wings were added in 1905. A new and larger sanctuary was built in 1918, which was destroyed by fire 16 January 1949. On 3 March 1949 work was begun on a new brick building with a seating capacity of 1000. A special church project was the Bible School begun in 1902 in a new two-story frame building, which was superseded by a new brick structure in 1919. Begun in 1947 , the Bible School and Academy in 1954 had adequate classrooms and auditorium, a faculty of six and a student body of 95, and a fully accredited high school. In 1947 a Home for the Aged was completed with a capacity of 20 rooms. Pastors serving the church to the 1950s have been Abraham Richert, Peter Neufeld, Isaac Harms, H. H. Flaming, J. J. Wiebe, J. K. Warkentin, and J. P. Kliewer, the last three salaried. With them served 21 associate ministers and 15 deacons. Twenty-eight missionaries went to the foreign field by 1954. In 1954 the church had a Sunday-school department, Christian Endeavor (Jugendverein), Christian fellowship, midweek Bible school, YMCA, YWCA (local only), choir, Gospel team, sewing circle, junior mission circle, a daily vacation Bible school, a weekly radio broadcast, and several organizations that did extension work. 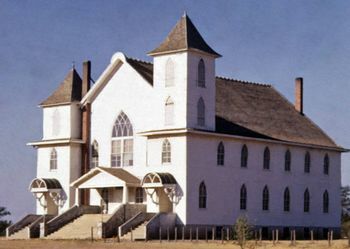 Members of the extinct Mennonite Brethren churches of Gotebo, Oklahoma, and Caddo County, Oklahoma, joined the Corn congregation between 1910 and 1920. Members of the extinct Krimmer Mennonite Brethren Church of Weatherford joined in the late 1930s. Kliewer, J. P. "Corn Mennonite Brethren Church (Corn, Oklahoma, USA)." Global Anabaptist Mennonite Encyclopedia Online. 1953. Web. 22 Apr 2019. http://gameo.org/index.php?title=Corn_Mennonite_Brethren_Church_(Corn,_Oklahoma,_USA)&oldid=115434. Kliewer, J. P. (1953). Corn Mennonite Brethren Church (Corn, Oklahoma, USA). Global Anabaptist Mennonite Encyclopedia Online. Retrieved 22 April 2019, from http://gameo.org/index.php?title=Corn_Mennonite_Brethren_Church_(Corn,_Oklahoma,_USA)&oldid=115434. Adapted by permission of Herald Press, Harrisonburg, Virginia, from Mennonite Encyclopedia, Vol. 1, p. 711. All rights reserved. This page was last modified on 11 March 2014, at 07:39.